1 of 6 Heat oven to 350 degrees F. Spray a 9-inch square baking pan with nonstick cooking spray. Line pan with foil, allowing sides to overhang; spray foil. 2 of 6 In small bowl, combine graham cracker crumbs and granulated sugar. Mix in melted butter. Press crumb mixture into prepared pan. Bake until golden, about 5 to 7 minutes. Cool on wire rack. 3 of 6 Prepare brownie mix according to package directions for cakelike brownies (adding 1/4 cup water, 1/3 cup oil and 3 eggs). Fold in chopped nuts. Pour batter into crust-lined pan. Return to 350 degrees F oven; bake until brownie is just set and a toothpick inserted in center comes out clean, 30 to 35 minutes. Cool completely in pan on a wire rack. 4 of 6 With electric mixer in medium bowl, beat cream cheese until smooth. Add peanut butter and confectioners sugar; beat until just blended (it will look lumpy). Add milk; beat lightly to loosen mixture. In separate bowl, whip 1 cup of the cream and gently fold into peanut butter mixture. Spread mousse evenly over cooled brownie. Refrigerate 1 hour. 5 of 6 Heat remaining 1/2 cup cream in a small saucepan over medium heat until just boiling. Remove from heat; add corn syrup and chocolate chips. Cover and let stand 5 minutes. Stir until smooth. Pour glaze over chilled mousse and spread to cover completely. Return to refrigerator for at least 1 hour. 6 of 6 Run a small knife around inside of pan and lift out brownie. Heat knife under hot running water and trim edges. Slice brownie, rinsing knife after each cut, into 5 strips about 1-1/2 inches wide. Cut each strip into 5 pieces about 1-1/2 inches square. 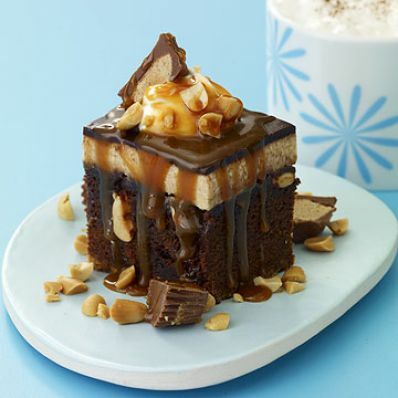 Transfer to a serving plate and garnish with whipped cream, nuts, candy and caramel sauce. Per Serving: 29 g carb., 20 g Fat, total, 302 kcal cal.